In a sauce pan sauté the chopped onions in 2 tbsp. of lard until soft. Soak breadcrumbs in the heavy cream and refrigerate. Toss the chicken and wild pork in the spices and seasonings until thoroughly mixed. Using the fine plate, grind these ingredients twice and refrigerate until chilled. Chill the mixing bowl as well. Knead the heavy cream and bread crumbs with the meat thoroughly about 4 minutes. (Test the seasonings in a small frying pan for taste.) Stuff the casings in 5 inch lengths. 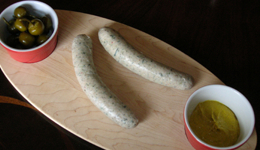 Poach in 170 degree water until the sausage has reach 160 degree internal temperature. Serve with spinach or favorite greens and a glass of chilled white sparkling wine like Casal Garcia.